Riverdance celebrates its 15th birthday in Ireland by returning to the Home of Riverdance and taking to the stage in The Royal Theatre Castlebar this autumn. 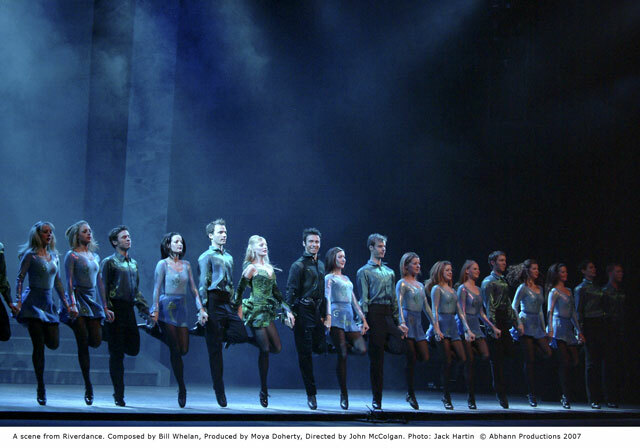 From 29th September for 5 shows, Riverdance plays The Royal Theatre for only the second time in his 15 years. Since the Royal Theatre underwent its renovations in 2008 it is now able to host such large events. Riverdance Music resonates from Mayo, where an initiative from Mayo County Council to celebrate the opening of the visitors' centre at the Ceide Fields archaeological site in 1993, the Mayo 5000 concert took place in the National Concert Hall, Dublin. Mayo 5000 was produced by Moya Doherty and John McColgan and included a new musical work by composer Bill Whelan called ‘The Spirit of Mayo'. The show included choral pieces by the choir Anuna and starred Irish dancers Jean Butler, Colin Dunne and Michael Flatley. This team was reunited a few short months later and the rest, as they say, is history. Composed by Bill Whelan, Produced by Moya Doherty and Directed by John McColgan, Riverdance opened in 1995 in the Point Theatre, Dublin and since then has been experienced live by over 22 million people worldwide. There have been over 10,000 performances in over 250 venues in 30 countries across 4 continents. In February 1997 the album won a Grammy Award as "Best Musical Show Album". After selling out all 10 shows when it came to The Royal Theatre in September 2008 it is advisable to get your tickets early for this event to avoid being disappointed. Tickets are priced at €28 for children, € 44 for adults and a family ticket for two adults and two children is available for € 125. Tickets can be booked through www.royaltheatre.ie, www.ticketmaster.ie, any Ticketmaster outlet nationwide or, for the price of a local call, the box office of the Royal Theatre, Castlebar at 0818 300 000. Excellent 'Stay & Show' package deals have been put in place to ensure that guests can take up special offers from the two sister hotels adjacent to the venue. These are available through The TF Royal Hotel (www.tfroyalhotel.com - 094 9023111) and The Harlequin Hotel, Castlebar (www.harlequinhotelcastlebar.ie - 094 9286200).